The Dutch chain solution for swiftly transporting from and to the United Kingdom after Brexit comprises 5 easy steps. The adjoining illustration shows you which these are. In this solution, each link in the logistics chain has its own role and responsibility. This applies to you as a transporter as well. Below, we will explain what is expected of you regarding both the transport via shortsea and via ferry. 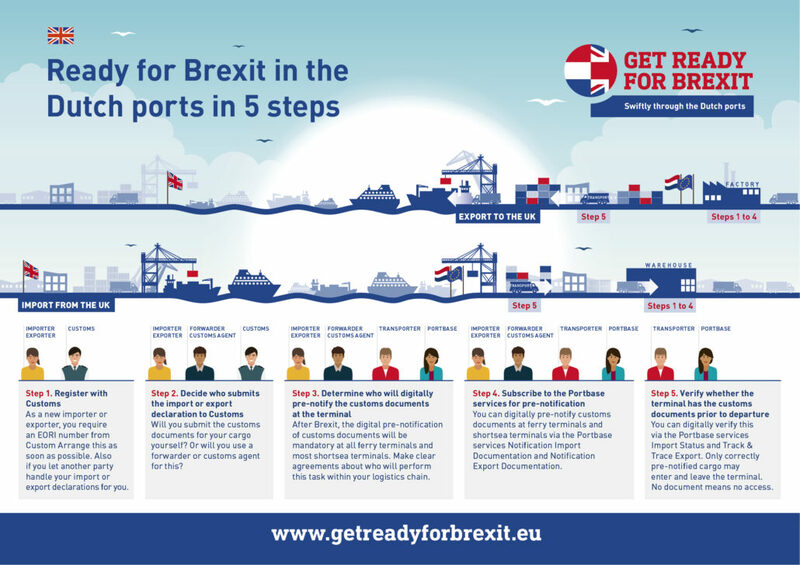 As a transporter, will you make sure that you are ready in time for Brexit in the Dutch ports? Of the 5 steps, you must at least perform step 5 in your capacity as a transporter. Click on the steps below for more information. 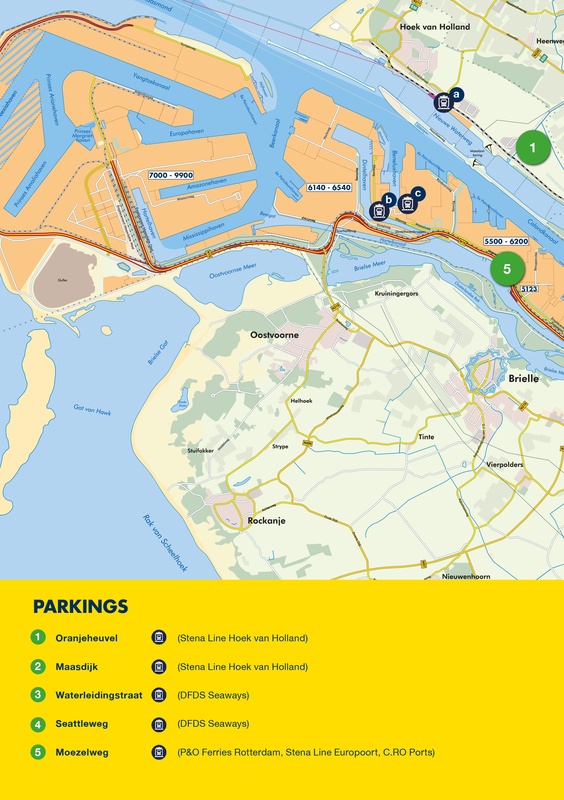 The Dutch shortsea and ferry terminals request that you always verify whether the customs documents accompanying the cargo have been pre-notified at the terminal before your driver starts his trip. If your client has not correctly pre-notified the customs documents, you will not be granted access to the terminal and you will not receive the cargo. If that is the case, your driver will be referred to one of the temporary parking locations in the port area. In consultation with you or with your client, he can still properly arrange the customs formalities here. This new, free service offers you real-time insight into the customs status of incoming cargo at shortsea and ferry terminals. You can immediately see whether the required customs obligations have been met. Customs might want to inspect the cargo as well. Only if both are in order – are ‘green’ – will you be welcome at the shortsea or ferry terminal. In all other cases, you will not be granted access. If this is the case, there is no point in still dispatching your driver to the terminal. Import Status is a free service which is web-based. By means of this existing service, you check whether the customs documents accompanying the cargo are known at the shortsea or ferry terminal prior to the driver’s departure. Without correctly pre-notified customs documents your driver will not be granted access to the terminal. Track & Trace Export is part of Notification Export Documentation and is a web-based service. There is a one-off connection fee for the usage of Notification Export Documentation. The day-to-day use – including Track & Trace Export – is free of charge. As a transporter, you will not be granted access to the terminal without a pre-notification. In addition to step 5 – verification of the presence of customs documents at the terminal – many transporters therefore choose to perform steps 3 and 4 as well. As part of the service provision to your client (the importer, exporter or forwarder) you then use Portbase to submit the customs documents at the shortsea and ferry terminals on his behalf. Please note: this only concerns the pre-notification of the necessary customs documents for which your client himself has previously submitted the import or export declaration to Customs. Should you want to perform this pre-notification of customs documents, then make clear agreements about this with your client! In order to be able to pre-notify cargo at shortsea and ferry terminals for your clients as a transport company, you need to subscribe to two Portbase services. Updated service for pre-notifying all customs documents for import at shortsea and ferry terminals after Brexit. Please note! Existing customers of this service also need to register again with Portbase for the usage of Notification Import Documentation 2.0 at shortsea and ferry terminals. The use of Notification Import Documentation 2.0 for the pre-notification of import documents at shortsea and ferry terminals involves a one-off connection fee of € 499.00 (excluding VAT). For the day-to-day use, there is a monthly subscription fee (€ 6.12 for the web service and € 20.43 for a system link-up) plus a transaction fee of € 0.18 per message. As a new participant, the one-off connection costs are € 499.00 (excluding VAT). The day-to-day usage is free of charge. The service is available as both a web service and as a system link-up. Some transporters take their service provision to customers even further. On behalf of their client (the importer, exporter or forwarder), they also take care of the import and export declarations to Customs. Should you want to offer this customs service in your capacity as a transporter, then make sure your client first requests an EORI number with Customs (if this has not already been done). Every company in Europe that imports or exports requires such a unique identification number from Customs. Even if said company uses you to perform the import and export declarations. Read more about EORI numbers on the Customs website. If you want to be able to submit import and export declarations to Customs as part of your service provision to customers, then separate software and licenses are required. Read more on submitting import and export declarations on the website of Customs. European Commission - All businesses concerned have to prepare, make all necessary decisions, and complete all required administrative actions, before the Brexit in order to avoid disruption. Follow the checklist and get to know which practical steps you need to take as soon as possible to be prepared.